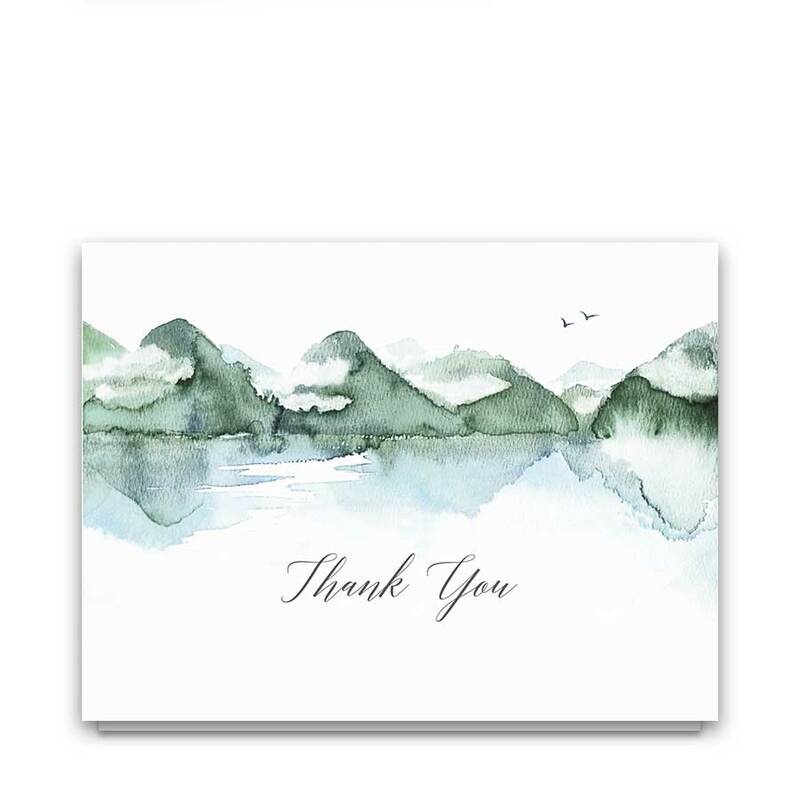 A fabulous watercolor, forest and mountain theme tree scape background greets your wedding guests at your wedding ceremony. We’ve added a beautiful fonts to create a wedding program which is designed for more modern and industrial themed weddings. Custom wedding programs that are both gorgeous and charming. Choose from two sizes below. To proceed please choose program size below. Each program will be printed on our Signature Paper. Mountain Wedding Program Template Watercolor Forest Lake. With your ceremony information printed on both sides (as needed), tea-length or standard size programs offer simplicity and elegance in design and style. 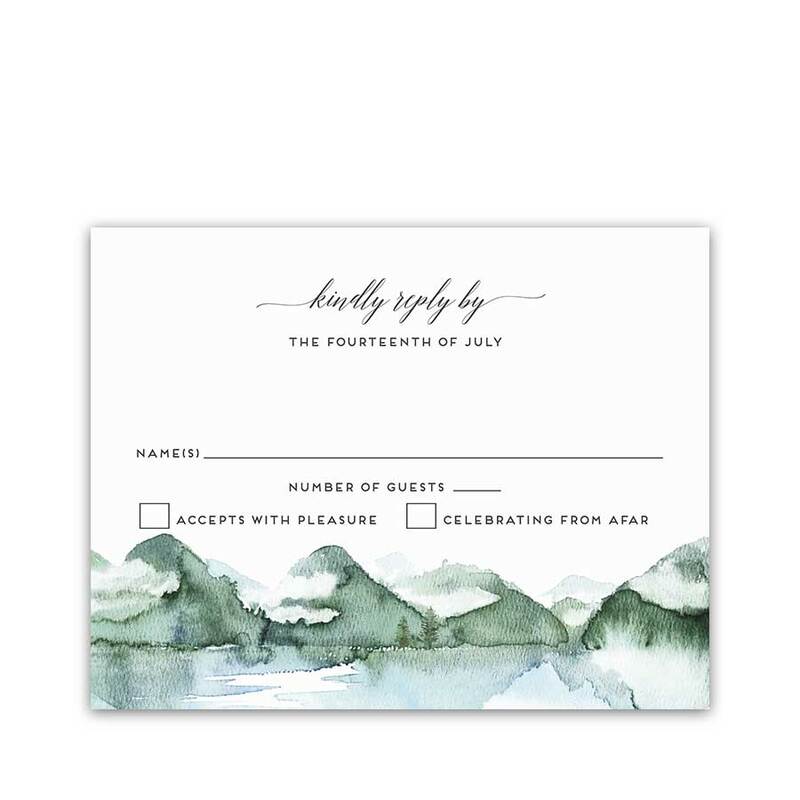 The Mountain Wedding Program Template Watercolor Forest Lake design belongs to the Mountain Wedding Invitations Template Watercolor Forest Lake collection. 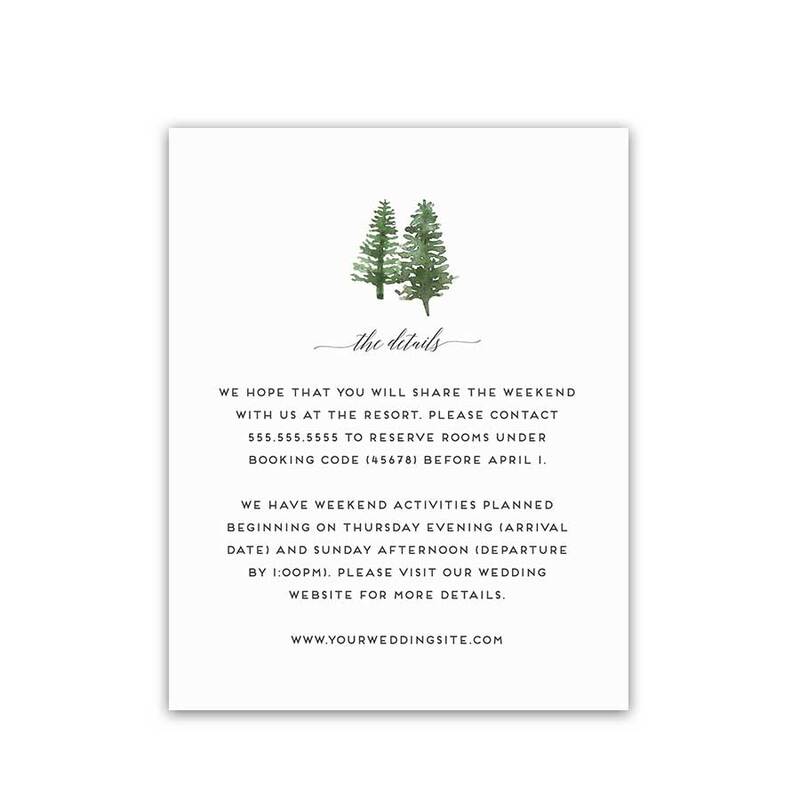 This wedding stationery suite is known for its unique and modern woodland mountain wedding style. Welcome to the Highlands Collection. This wedding program creates an absolutely gorgeous introduction to your modern mountain woodland wedding. The hand writing script fonts add a unique touch to the design. 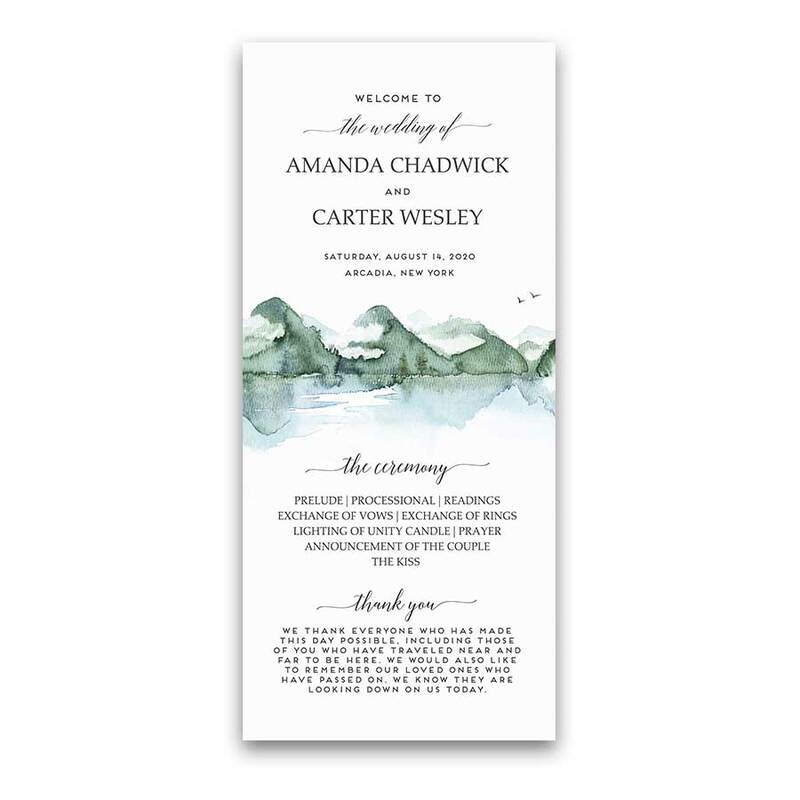 We also have an entire wedding suite with this watercolor forest theme wedding in the store. Therefore, click on any item below for coordinating products in this design and let’s get your wedding planning underway! More mountain wedding invitations are available in the store as well. In fact, check out our Pinterest boards for more great wedding inspirations and ideas! 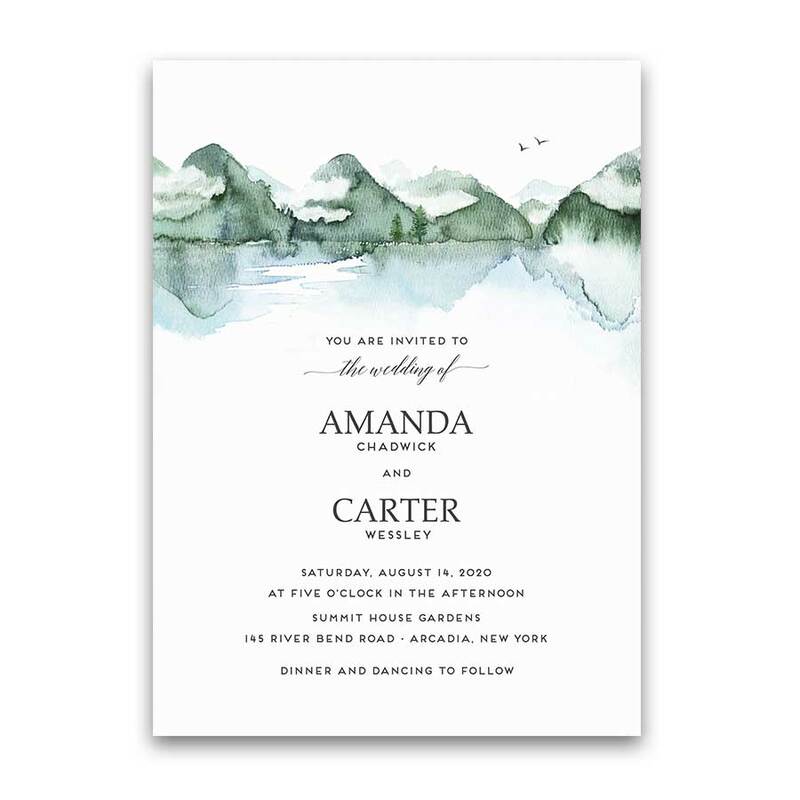 The Mountain Wedding Program Template Watercolor Forest Lake offers two size options. Select between a program which is 5 inches wide by 7 inches long. The second option is a 4 x 9.25 card. We print the program on one or two sides, depending on the amount of text you provide. A proof arrives prior to printing so that you can check for errors or make changes. Design work is added based on the amount of wording you provide. Therefore, please include the exact wording as you would like it to read on the order form. Furthermore, a coordinating wedding ensemble is available by clicking the links below.